Cherries are in the local markets now and I’m super excited. I love cherries and usually just pop them into my mouth fresh, but sometimes I get a hankering for something a little different. 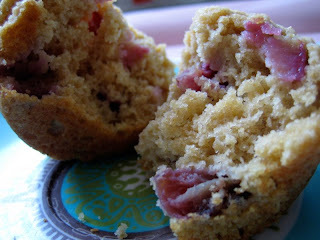 Sometimes it works, like these cherry muffins below, and sometimes it doesn’t. As my bag of cherries began to dwindle and there only seemed to be the ugly testical-looking cherries left alongside the softer, darker ones that I don’t like to eat. I figured muffins would be the way I could save these sweet babies from the compost heap. So I got to pitting and chopping them and threw them into a simple muffin batter. I went with a whole wheat pastry flour since I got a huge bag for cheap at my local Chinatown grocer. If you don’t have access to ww pastry flour, try half white and half whole wheat to help cut through the heaviness of regular whole wheat. The resulting muffins were light, tasty and were an easy way to grab something quick for breakfast. In other food news, this past weekend I attended the Eat! Vancouver festival and got to interview celebrity chef, Bob Blumer. Read my write-up about it on the Food Network Canada site. 1. In a large bowl, combine flour, sugar, salt and baking powder. In a smaller bowl, mix together the egg, milk, vanilla, almond extract and melted butter. 2. Dump the cherries into the flour mixture and then add in the liquids. Mix until everything has blended together. 3. Grease 12 muffin tins and then spoon batter into cups. Bake at 375 until tops are golden, about 25 minutes. Makes 12 muffins. “ugly testical-looking cherries” cracked me up! I know what you mean about tending to eat things (in season) as-is. I love tomatoes and eat them by the ton when in season but rarely make anything with them. Love the cherry muffin idea! Ugly testical like cherries is almost as bad as flaccid carrots. baking or stewing is the only solution so bravo. Hey, hey, these are looking good! I’m always down for a new muffin recipe. veggiegirl, fresh cherries are the best which is why i don’t like to mess with perfection…but something has to be done with those ugly soft ones!! it’s funny, rachel, i’m not crazy about tomatoes in their raw form…but i do love making stuff with them! thanks, katerina! i had to use up all those ugly cherries somehow! yay cherries! i share your joy, hag. i can’t remember how much i paid for them (i got them from t&t;)…but i’m sure they’ll be real cheap soon enough! I just saw some cherries as I was passing a gorcery store today…. Yea! Cherries! Where have you found the best deal??? Those muffins look good…but can you really only eat one at a time? Lately you seem to be inspiring the heck out of me, especially in the baking department. I’ve got cherries waiting to be used for something, besides my afternoon snack. Think I’ll try it with all white whole wheat. I have seen cherry recipes pop around and they look amazing. These muffins are no exception – I would love to try them! I was at Whole Foods the other day and bought a huge bag of cherries. I bought so much because I was starving. So now I have a ton of cherries left and might just make those lovely little muffin gems you made. The cherries at Whole Foods are perfect in taste. For the first time this year, I had cherries sliced up in pancakes – another great use for the few cherries remaining that don’t get popped into your mouth! these look so wonderful. i love cherries and looooove them in muffins. im making these for my take to work breakfast! Awesome recipe! For some weird reason I love cherries when cooked or baked into something but not fresh, they are just too tart. I’m going to try baking these muffins this weekend with dried blueberries. I recently made bread pudding with dried blueberries and a cherry sauce on top and I love this combination of berry goodness. testical-looking cherries…wouldn’t that be “testicular cherries”? or is that crossing a line? I noticed in Vancouver it seems like there’s a produce shop every few blocks. I’m so jealous. I’m also jealous you have local cherries. We don’t have those here. I like the idea of eating locally, but New England local is a very different thing from your local! these look simply scrumptious! love the fact that it uses whole wheat flour. I am so with you on eating things in season before I use them in a recipe! I do that all the time. Your muffins look delicious! I have been on a Googling mission for a cherry muffin recipe and nearly gave up until I found yours! This is exactly what I’ve been looking for as I too am at the dregs of my cherries. patrica, ’tis the season for cherries! dawn, these would be perfect to use up your older cherries. of course, if your cherries are delicious as is, keeping eating them out of hand! caroline, cherries in pancakes? i’m in! meghan, these are the perfect take to work breakfast. lucky me, i work from home, so i take them to work all the time! haha. angelique, these are sweet dark cherries, not the tart morello cherries. personally, i love the tart ones! but subbing in blueberries, dried or fresh would be great in these muffins. when i moved to vancouver, jen, that’s one of the things i loved about this city: produce markets everywhere! zentummy, these are good…especially because of the ww flour! sharon, thanks for stumbling here! enjoy the dregs. I’ve used cranberries in a similar recipe but will have to try the cherries. Sounds delicious. I’m so happy cherries are available now! I’m not sure I’d be willing to sacrifice any to go into a muffin, though yours do look delicious! Love your resourcefulness for taking ugly testical-looking cherries (LOL! )and making them into lovely cherry muffins. So damn brilliant!! jar, cranberries or really any fruit would be great in these muffins! 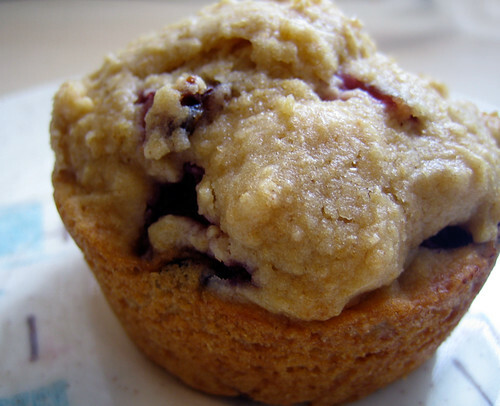 eatme_delicious, only when you’re cherries are going off would you make these muffins. otherwise, don’t bother! I’m late to this party, but I made these this morning and they were perfect. I’m not an experienced cook and was a little thrown that the instructions didn’t say where to add the sugar, but then you’ve only got the two choices and it worked out fine. I used sour cherries and really liked the balance of the tart against the mild sweetness of the dough. Great blog! These are super yummy! I just pulled them out of the oven about 1.5 hours ago. I did sub buttermilk for the skim milk, but other than that, left as is. I have a bunch more cherries, so I think I will have to make some more. Do you know how well these freeze? Thanks for posting! 3pennyjane, glad you were able to make some great muffins with my lopsided instructions!! i’m jealous that you have sour cherries in your area. sadly, we don’t. tasha, i’m sure they freeze fine! glad they tasted great and i’m sure the buttermilk substitution was tasty! Your blog is amazing! I’m adding you to my igoogle so I can easily check for updates. Thanks for sharing such wonderful recipes. This looks great! I’m glad to find a cherry recipe – I have an orchard that yields about 10,000 pounds a year. I can them, dry them, make jam, make pies, but I’m always looking for something new! do you add the sugar in in the dry mix? it doesn’t say where to add sugar. when i tried this, the batter was more like a dough – is that expected? Tiffanie, I’ve amended the recipe – yes the sugar goes with the dry ingredients. It’s been ages since I’ve made them, but I think the texture of the batter can be thick. Let me know how they are once they’ve baked! Did anyone mention eating frozen cherries. My husband and I eat a bowlful each almost every night while watching TV. They are addictive!!! I’ve never had frozen cherries. I’ve had frozen grapes, and they are great. I’ll have to try the cherries.